With Shimoda Takashi, Funakoshi Yoshitaka travelled with his father Gichin on the many demonstrations and lectures throughout Japan. The son of Gichin, Yoshitaka added the 'do' in 'karate-do' in a friendly re-development of his fathers full on style of Okinawa-te. 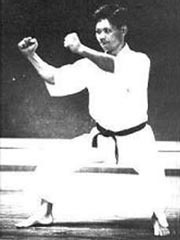 Yoshitaka was known for his deep stances and leg techniques, introducing Kiba Dachi, Yoko Geri, and Mai geri forms to the Shotokan style. Suffering from Tuberculosis throughout his life Yoshitaka died at 39 in 1945.